André Balyon was born on April 2, 1951, in The Hague, Netherlands, as the oldest of seven children. He has two children of his own, Rogér and Michelle. André began painting at the age of fifteen under the tutelage of various masters in his native Holland. All four of his brothers have become artists and graphic designers as well. At eighteen, André moved to Germany and was employed as a specialized welding engineer for a firm that produced bank vaults. “Not much I could learn there, except for how to open up a safe in no time.” Eventually André decided to commit the rest of his life to the Arts. “I love to paint the Dutch countryside. Growing up near the coastline, I felt the moisture-saturated air. I remember mymother telling me to look at clouds, “Just look and observe the clouds, it’s a humbling experience.” It was there that André gazed for hours on end at the dramatic cloud formations, caused by the colliding warm air from a gulf stream, the North Sea, with cold air masses from the North. of Disney’s background artists on oil painting techniques used for the sky part of the animated motion picture The Lion King. At the age of 21, André started a new life in the United States. After a successful and productive three-year period in Miami, Florida, he moved to Los Angeles, California where he worked for six years. 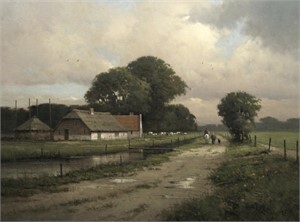 Following a number of exhibitions of his oil paintings throughout the Los Angeles area, Denver, Houston, and Carmel, André temporarily returned to the Netherlands for several one-man shows in Europe as well as to study the techniques of etching. André feels very much inspired by artists such as George Inness and John Singer Sargent. “I feel that we, the living artists, are very fortunate to learn from, and be inspired by the many artists, styles, and art movements of the past. It is astonishing to know that artists before the 15th Century knew little about drawing and painting in perspective. It has been a true evolution ever since. We are standing on the shoulders of the great masters. All we know and learn is through books and information about whatever experiences someone else may have had before us. We can only hope to add to that knowledge through our own experiences, however little this may be”. André Balyon was born on April 2, 1951, in The Hague, Netherlands, as the oldest of seven children. He has two children of his own, Rogér and Michelle. André began painting at the age of fifteen under the tutelage of various masters in his native Holland. All four of his brothers have become artists and graphic designers as well. While employed by ITT as a draftsman/engineer, André continued his artistic endeavor. He believes that his technical background in creative construction helped him in his artistic career. “Creating a three dimensional image on a flat surface is problem solving for the most part, and mathematical in a sense as well.” At eighteen, André moved to Germany and was employed as a specialized welding engineer for a firm that produced bank vaults. “Not much I could learn there, except for how to open up a safe in no time.” Eventually André decided to commit the rest of his life to the Arts. “I love to paint the Dutch countryside. Growing up near the coastline, I felt the moisture-saturated air. I remember mymother telling me to look at clouds, “Just look and observe the clouds, it’s a humbling experience.” It was there that André gazed for hours on end at the dramatic cloud formations, caused by the colliding warm air from a gulf stream, the North Sea, with cold air masses from the North. André’s fascination with the sky and cloud formations explains the dominant role the sky plays in many of his paintings. For that reason, in 1994 André was asked by the Walt Disney Company to assist and instruct a large number of Disney’s background artists on oil painting techniques used for the sky part of the animated motion picture The Lion King. At the age of 21, André started a new life in the United States. After a successful and productive three-year period in Miami, Florida, he moved to Los Angeles, California where he worked for six years. Following a number of exhibitions of his oil paintings throughout the Los Angeles area, Denver, Houston, and Carmel, André temporarily returned to the Netherlands for several one-man shows in Europe as well as to study the techniques of etching. André feels very much inspired by artists such as George Inness and John Singer Sargent. “I feel that we, the living artists, are very fortunate to learn from, and be inspired by the many artists, styles, and art movements of the past. It is astonishing to know that artists before the 15th Century knew little about drawing and painting in perspective. It has been a true evolution ever since. We are standing on the shoulders of the great masters. All we know and learn is through books and information about whatever experiences someone else may have had before us. We can only hope to add to that knowledge through our own experiences, however little this may be”.